Are you missing a tooth or several teeth? Imagine waking up with a beautiful, complete smile. Dr. Arthur Thurm is a general dentist and certified dental anesthesiologist. He has three decades of experience repairing and replacing teeth to create beautiful, healthy smiles. Best of all, the dental work can take place while the patient is comfortably asleep or sedated. A dental implant is a replacement tooth option. The implant is a titanium post that is placed in the jaw to mimic the roots of a tooth, and then topped with a crown that looks just like a natural tooth. It’s a long-lasting solution to a missing tooth; with proper care, a dental implant can last a lifetime. Dental implants can also be used to replace several missing teeth. They can be used to anchor a bridge, a removable denture, or a non-removable denture. What’s the Difference between an Implant, a Bridge, and a Denture? If you’re missing a tooth, there are several ways you can replace it. A dental implant takes the place of the missing tooth. The post takes the place of the tooth roots, and then it’s topped with a crown that looks just like a natural tooth. In contrast, a bridge fills the gap left by the missing tooth by using the teeth on either side to support the artificial tooth. The dentist files down the adjacent teeth and caps them with crowns that are attached to the artificial tooth. The artificial tooth rests on top of the gum, but does not extend into the jawbone. Over time, the jawbone beneath it can recede, leaving a small space between the gum and the tooth. A partial denture, which is sometimes called a flipper, contains an artificial tooth that is attached to a wire frame that slips over the adjacent teeth. It is removable; you take it out at night to clean. Natural look and feel: Dental implants look and feel like your own teeth. Improved appearance: Dental implants are the only tooth replacement option that extend into the jawbone. This keeps the jawbone from deteriorating into a “sunken cheek” look, and keeps other teeth from sliding out of place. Improved ability to eat: Patients with dental implants can eat apples, carrots, corn, and other foods that can be difficult to eat with a removable denture. What is All-on-4® Implant-Retained Denture Treatment? If you are missing all of your top or bottom teeth, the All-on-4® Treatment method may be the best solution for you. Unlike a traditional denture, which sits on the gum line and is kept in place by denture paste, the All-on-4 treatment method secures a full set of teeth to four dental implants. This is a popular choice for people who have trouble wearing dentures. Unlike a traditional denture, which can slip and slide, the implant-secured denture stays in place. It’s permanently fixed in the mouth, so you do not remove it at night. Best of all, it allows you to eat whatever you like – even corn on the cob and steak. 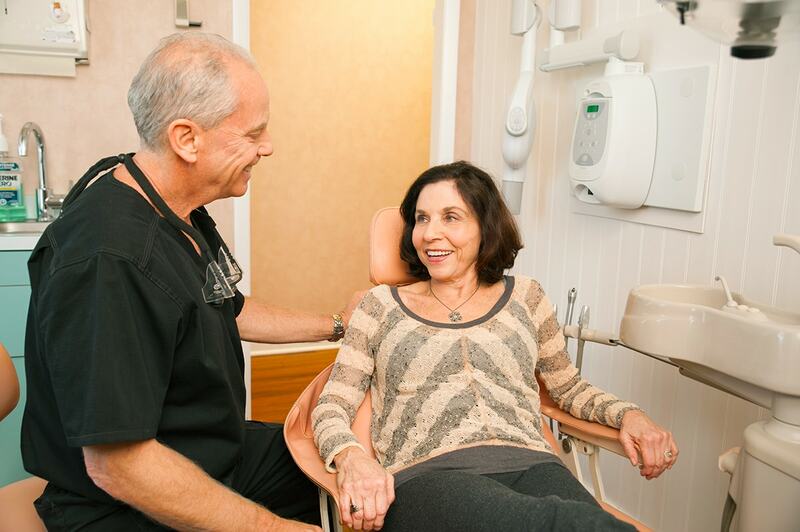 It’s easy and comfortable to get a dental implant, especially with the sedation dentistry options we have available at Thurm Dental. Call us today at (856) 335-1775 to schedule a dental implant consultation.